Many across the predominantly Muslim countries surveyed want Islam to have a major influence in politics. Most in Pakistan, Jordan and Egypt believe their laws should strictly follow the Quran, while majorities or pluralities in Tunisia and Turkey say their laws should at least adhere to the values and principles of Islam. Views in Lebanon are divided along sectarian lines. Majorities in most countries also say Islam currently plays a large role in their nation’s political life – and they mostly view this in a positive light. Tunisians are particularly likely to see Islam as a major, and constructive, influence in their country’s government. The sentiment that religion is influential in politics has increased substantially in Egypt over the past year. Jordan is the only country in which a majority (63%) says Islam plays a small role in their politics, with most saying this lack of Islamic influence is a bad thing for their country. 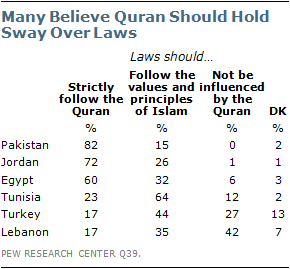 Broad majorities in Pakistan, Jordan and Egypt believe their nations’ laws should strictly follow the teachings of the Quran, including 82% in Pakistan. 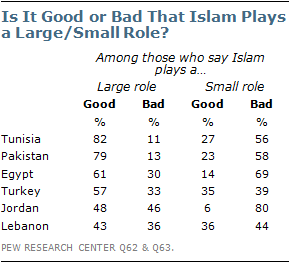 Meanwhile, respondents in Tunisia, Turkey and Lebanon are less likely to endorse a dominant role for Islam. Only about two-in-ten in each country believe laws should be based strictly on the Quran. Rather, a majority in Tunisia and a plurality in Turkey say the law should follow the values and principles of Islam but not strictly follow the teachings of the Quran. Among the Lebanese, attitudes vary greatly by religious group. While a majority of Shia Muslims (57%) prefer the law to follow the principles of Islam, Sunni Muslims are split between this position (36%) and the belief that the Quran should play no role (38%). Most Lebanese Christians (63%) say the law should not be influenced by the Quran at all. Younger people are less likely to endorse a strict role for the Quran in Egypt and Lebanon. Among Egyptians, 54% of 18-to-29 year-olds believe laws should be strictly based on the Quran, while 68% of those age 50 and older say the same. Similarly, in Lebanon, young people are 11 percentage points less likely than their elders to endorse a strong role for the Quran in politics. Across five of the six countries, majorities say that Islam currently plays a large role in the political life of their country. More than eight-in-ten in Tunisia believe Islam has a major influence on their politics. 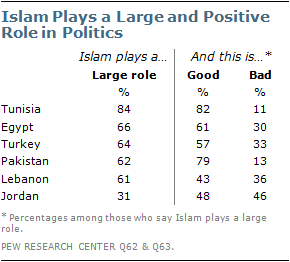 Similarly, more than six-in-ten in Egypt, Turkey, Pakistan and Lebanon say Islam plays a large role in politics. In Lebanon, opinion varies considerably by religious affiliation – three-quarters of Christians say Islam plays a large role, compared with 54% of Sunni Muslims and 41% of Shia Muslims. 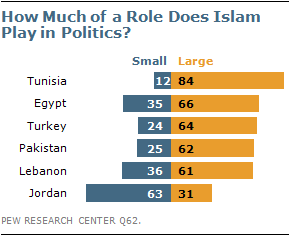 Jordan is the only country surveyed where a majority says Islam has a small role in government. Just 31% believe Islam plays a large role. Among those who say Islam has a major influence, majorities in Tunisia, Pakistan, Egypt and Turkey say this is a good thing. In Jordan – where most respondents believe Islam is not influential in politics – eight-in-ten see this small role for Islam as negative for their country. Overall, the Lebanese are more divided in their evaluations of Islam’s influence, though attitudes differ greatly by religious group. Among those who believe Islam plays a large role in Lebanese politics, Shia Muslims (81%) are much more likely to say this is a good thing than either Sunni Muslims (53%) or Christians (21%). In Lebanon, young people are less likely to see Islam’s political influence as positive. Only 37% of 18-to-29 year-olds embrace a significant role for Islam in politics, meaning they either believe Islam plays a large role and say this is a good thing or believe it plays a small role and say this is bad. In contrast, 51% of those age 50 and older say the same.